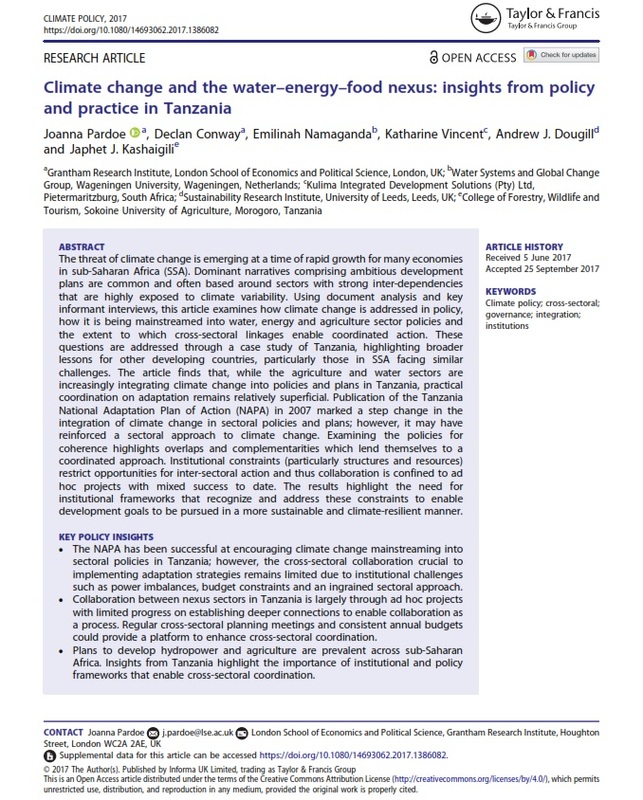 The journal Climate Policy has now published online a paper "Climate change and the water–energy–food nexus: insights from policy and practice in Tanzania". The paper, led by Joanna Pardoe from the London School of Economics and Political Science, with Declan Conway, Emilinah Namaganda, Katharine Vincent, Andy Dougill and Japhet Kashaigili, is an output of the Future Climate For Africa UMFULA project. The paper investigates how climate change is addressed in policy, how it is being mainstreamed into water, energy and agriculture sector policies, and the extent to which cross-sectoral links enable coordinated action. Whilst the agricultural and water sectors are increasingly integrating climate change, practical coordination remains relatively unsuccessful. Addressing the institutional barriers to coordination is important for coherent climate-resilient and sustainable development.